This is another gem that has been circulating around the bird forums for years. The author is unknown. Enjoy! Stuff turkey and place it in the roasting pan, and remove Parrot from edge of pan and return him to perch. Have another cup of coffee to steady your nerves. 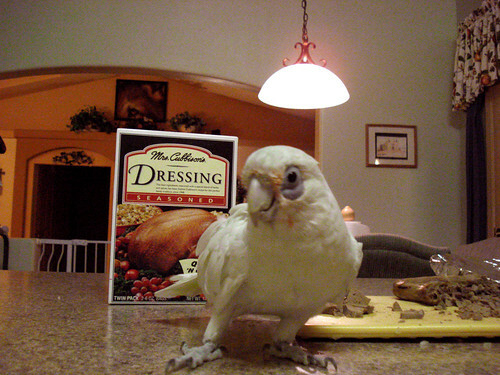 Remove Parrot’s head from turkey cavity and return him to perch. Prepare relish tray, and remember to make twice as much so that you’ll have a regular size serving after the Parrot has eaten his fill. Peel potatoes remove Parrot from edge of potato bowl and return him to perch. Arrange sweet potatoes in a pan and cover with brown sugar and mini-marshmallows. Remove Parrot from edge of pan and return him to perch. Brew another pot of coffee. While it is brewing, clean up and replace the torn filter. Pry coffee bean from Parrot beak. Have another cup of coffee. Place roasted turkey on a large platter, and cover beak marks with strategically placed sprigs of parsley. Put mashed potatoes into serving bowl, re-whip at last minute to conceal beak marks and claw prints. Place pan of sweet potatoes on sideboard, forget presentation as there’s no way to hide the areas of missing marshmallows. Set a stick of butter out on the counter to soften. think better and return it to the refrigerator. Wipe down counter to remove mashed potato claw tracks. Cut the pie into serving slices. Wipe whipped cream off Parrot’s beak and place large dollops of remaining whipped cream on pie slices. Whole slices are then served to guests, beaked-out portions should be reserved for hosts and hostesses. I wish everyone a happy Thanksgiving with their families and birds!